There is no “right answer” in design. To stay on the right track you need to really understand the problem you’re trying to fix and constantly get feedback from the people you’re designing for. But even if you’re talking to them it’s easy to get stuck designing on your own. Design critiques with your colleagues are one of the best ways of helping you get a new perspective on your design. You can sanity check your ideas and uncover things you never would have thought of. But it’s easy for people to get distracted by unimportant details, have a different idea of what the problem is or just simply misunderstand how the solution you’re proposing would actually work. We’re doing design critiques all the time, so I’ll walk you through how we do them at Intercom, and share a Sketch template we use every day. Before showing any designs make sure everyone clearly understands the problem. You’ll want to get 1-5 people with different perspectives on the problem (designers, engineers, support reps etc.) It’s critical to start by defining the goal of the critique and guiding others towards it. What do you need to make progress and keep moving forward? What kind of feedback are you looking for? It’s up to the designer leading the critique to define the goals, the problem they’re solving, potential solutions, and walk others through them. At this point, it’s helpful to print posters that describe the problem and the proposed solutions and stick them on the wall. This makes it easy for everyone to keep the whole thing in their head and talk about specific options. No more “Can you scroll back to that design? No, the other one”. If we’re discussing interaction design we’ll also have prototypes to test. Only 5% of new sign ups invite their colleagues in the first 7 days. We’ve seen that users who invite their colleagues tend to be more active and stick around longer. When everyone is on the same page and understands the problem you’re trying to solve, it’s time to show how you’re proposing to fix it. Ideally you should have a number of radically different options to show. This helps people understand why some options are better than others. Again, give a name for each of your proposals so everyone can refer to them and describe them in one paragraph of plain English. It’s really important these ideas are easily comparable, so instead of mixing multiple ideas together break them apart into separate ideas. Otherwise you might dismiss a good solution just because it was coupled with a bad one. It’s often useful to draw a diagram of how your proposed solution works before diving into UI detail. 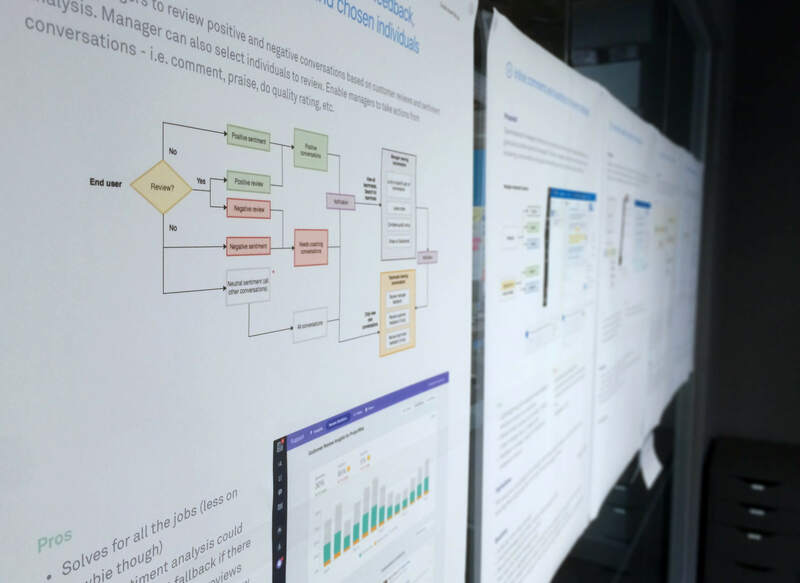 Particularly with interconnected products like Intercom, starting with a high-level map of how your design behaves as a system is essential. Then show your proposed interface design either as prints or a walk others through a prototype. Lastly, say what you think is good and bad about each of the options, and be brutally honest. If there’s any open questions about your proposals that still need to be figured out, mention those as well. When everyone understands the problem and how you’re proposing to fix it, that’s when you can have a productive discussion. A great way to start it is by saying which of the options you think works best and why. It won’t be long before others respond with disagreements, ways to further improve your solutions, or argue for other options that weren’t even presented. Remember, keep the meeting goals in mind. Sometimes you’ll get feedback that you’re not actively looking for. For example, you might be looking for feedback on a specific interaction, but getting questions about why you’re doing this in the first place. These are great sanity checks. Without a great answer to this question, you really should be asking yourself whether this is a good problem to solve. However, if you’re still trying to figure out how the system should work but getting feedback on the interaction details, let the group know it’s too early to be focusing on that and guide the conversation back towards the type of feedback you’re looking for. Depending on the goals for your meeting you might come out with concrete decisions and a solid rationale for them or ideas to digest. Most importantly you should have concrete next steps to take. 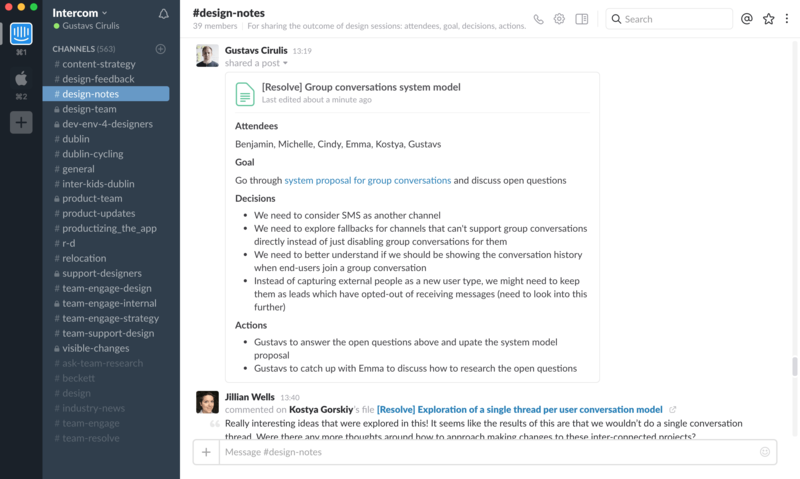 We write these up and share them on our #design-notes Slack channel, to make sure nothing slips between the cracks and keep other people who were not there in the loop and allow them to give feedback. Doing design critiques regularly and effectively can can lead to incredible results. Some people come up with interesting ideas, others build on top of them and others connect it all together. It’s something that a single designer – even a unicorn – can’t do on their own. 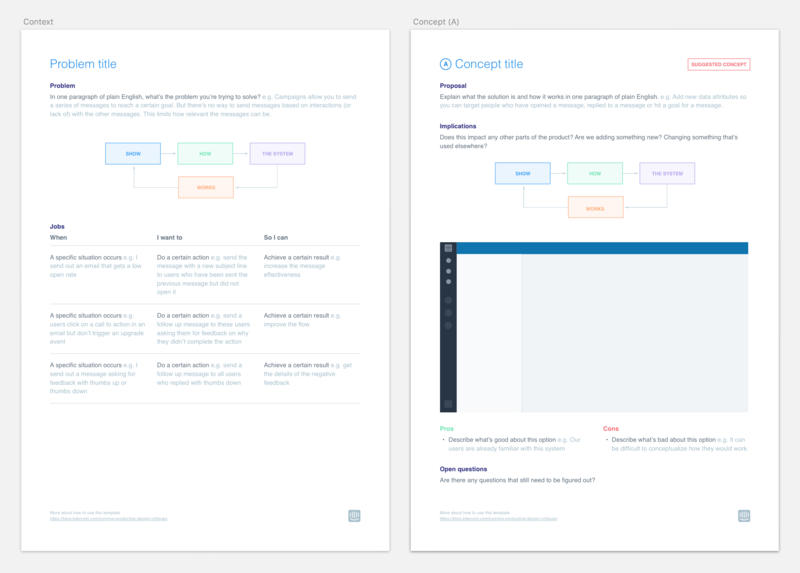 To streamline this process we’ve made a Sketch template you can download and try in your next design critique. Give it a try and let us know what you’ve found working well in your design critiques.